Halong bay, a mysterious area that makes you wonder if dragons are really just a fairy tale. Tale sounds similar to tail, speaking of tails, the myth goes that many years ago, a dragon landed in this region on a huge limestone rock, while descending, his tail broke the limestone in many pieces creating the Natural Wonder we can behold today. Whether you believe legends or not, it’s a gripping story surrounding the awe and wonder that you can witness while taking a beautiful cruise through this landscape. On a normal day just like any other, I woke up, took a shower and went to work. However what was waiting for me was not just another day on the job, I arrived to sit down behind my desk while my colleague suddenly asked me; ‘Do you want to go to Halong Bay?’ ‘Yes, of course!’ I replied, and that’s how, an hour later, I was in a taxi going towards Halong Bay. On arrival at the port, total luxury awaited me, my room was upgraded to elegance, the company created a new style of cruise and I was one of the lucky people that got to go on one of their first ‘tests’, I call it tests, but of course everything was tested beforehand, this was just the second time the company used their elegance cruise. Upon arrival at the boat, everything that happened was without me lifting as much as a finger, except for accepting the warm towel that I got on entering the ship and opening my cabin door. 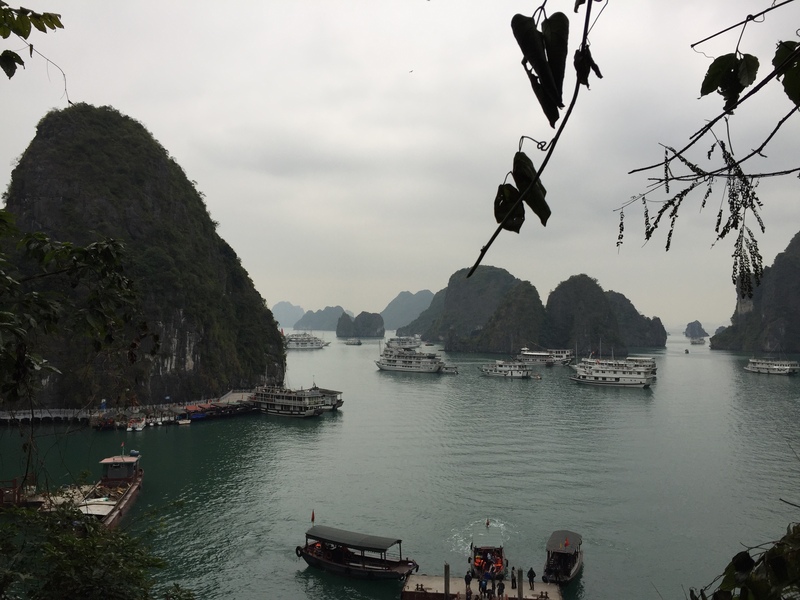 The boat set off, while inside a small welcome with beverages took place, where they explained about the happenings to come, safety measures, who to contact, where everything is located and some general information on Halong Bay. After the welcome, I decided to go top deck to look around, we were yet to be in the middle of the bay, but I could already see what I could expect in due time. 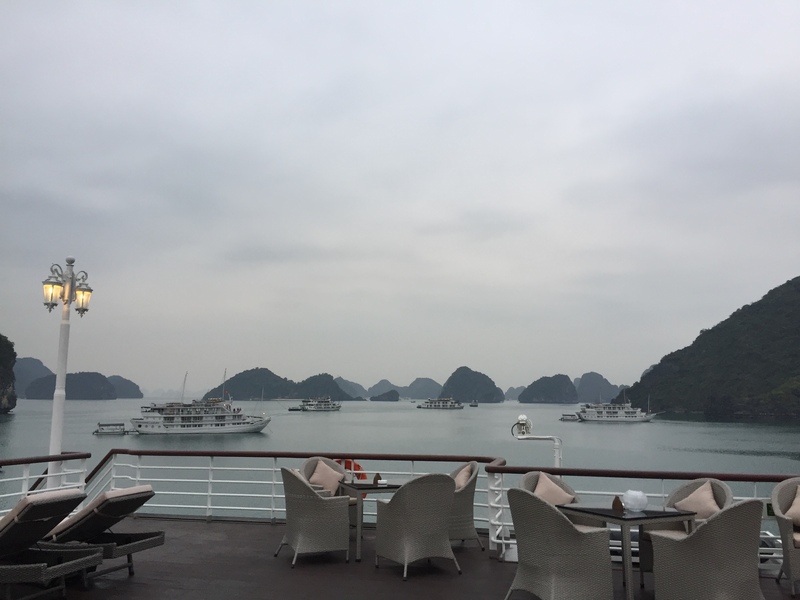 Thousands of limestone mountains or rocks, whichever you prefer, were coming closer, while I enjoyed a drink on the top of the deck enjoying the weather, mind you I was lucky the heat of Vietnam didn’t kick in yet, and could enjoy a 24 degrees Celsius with a little bit of sun. That only took a while, once we went deeper into the region, cloudy weather appeared, which I did not mind in the slightest as the whole area became so much more mysterious than I imagined, with fog in the distance that covered many limestone mountains before appearing out of thin air while we got closer. It was time for the first activity, we had two options, a water village , or a cave which was the place I decided to go. We went on a small boat to ride the waters towards a area which looked like a small river village. 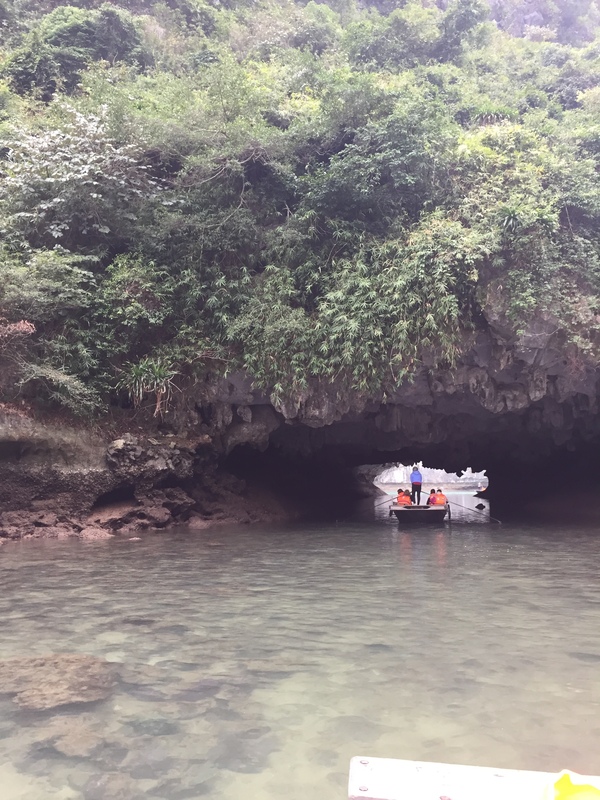 Once arrived, we went on a traditional bamboo boat towards the cave, which was more like an opening of a limestone mountain that took you to a small inner bay surrounded by limestone mountains with no other exit. I was thinking; ‘if this cave collapses, I will be stuck on this small boat for a long time…’ fortunately for me, that didn’t happen, and I could enjoy the sights of the area, which looked to me like one of these view that you can see in a pirate movie, where they get stranded in the middle of no-where, with only nature and no sophisticated life. It was beautiful. This marked the end of the activity for the day and we returned towards our cruise boat. While enjoying the marvelous sight of Halong Bay, the intercom let me know that it was time for dinner. I enjoyed a nice 3 course dinner that was up to international European standards as far as I was concerned. Afterwards I decided to go to my cabin to refresh myself. I hurried as I did not want to miss any of the spectacular views, so I went top deck again to relax, while watching and participating in a cooking class. The boat anchored in a nice area where, as it slowly got dark, all the different other ships that laid anchor lit up their lights, next to no sound was present and came to a total relaxed state up on the top deck while enjoying friendly conversations with other people who were of the same state of mind. Too bad the Iphone does not take nice pictures in the dark, else I would've been able to share this magical moment. 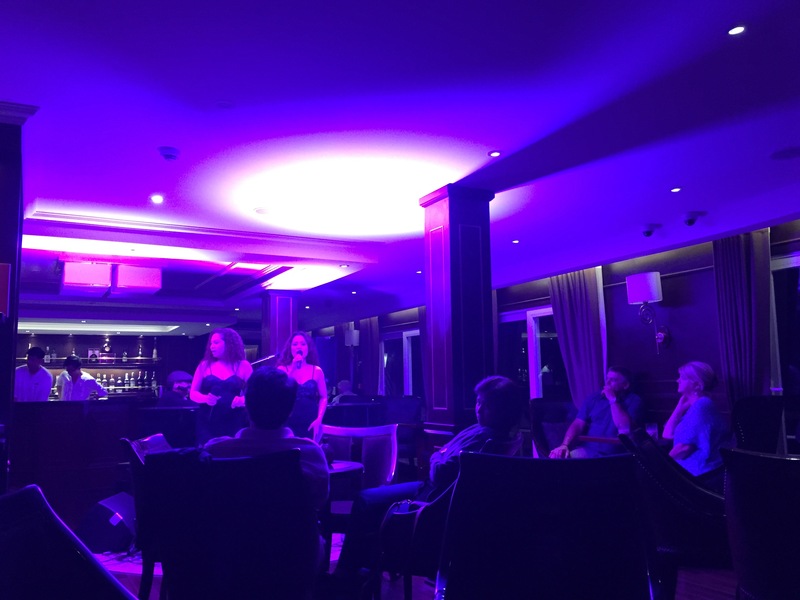 Once nighttime arrived, there were some singers at the bar area, with people dancing, enjoying drinks and talking to random people who we met during the cruise. The next day there were some more activities, it was either a small island with a beach and a walk to the top, or a massive limestone cave. I went with the cave as I felt like the weather was not suitable to take a dive, as well as my general interest in caves, a fantastic creation of nature. The cave was really large and magnificent; the only bothersome thing was that literally every other cruise boat that I saw the past night had the same activity planned at the same time! What a shame. However this did not ruin my cave exploring experience, as I am a fast walker, I made sure to move upfront, not to be hindered by other groups. 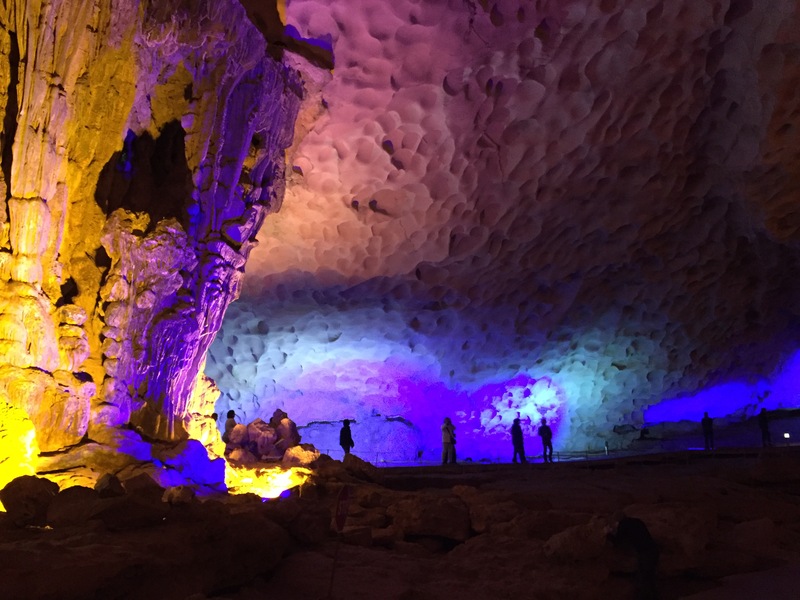 I generally don’t require information on caves, as I have seen so many before and know what to look for, but if you are a person that wants to know more about the location, a tour guide from the cruise boat is there to inform you, with excellent English if I might say so. Strolling through the cave was truly enjoyable, as each area had a different feel, and other rock formations to behold. At the end of the cave, you are rewarded with a stunning view of the bay in which the cave is located. Once finished we returned to the boat, that took the journey back from its anchored place, towards land. I again placed myself on the top of the deck to witness Halong Bay’s splendor. I could not get enough of the view that changes every 10 minutes as new limestone mountains appear out of nowhere. We arrival back at the port, which marked the end of my journey and experience of Halong Bay and I have to say, I would definitely go here again with friends, family, or significant other, and if I do so, will surely give Jewel Tours a call for which I work at the moment that gave me the chance to go on this marvelous adventure.